This post captures the big picture for this website. If you take time to read this post, all other posts will be easy to follow and use for planning your writing lessons. If you are a school teacher or homeschool parent, I hope so much that you will find these plans helpful, quick go-to’s for any time that you need a writing lesson. The prompts are categorized by genre, holidays, seasons and animals for your convenient perusal. They all come with a PDF version of the lesson for you to print out and use. 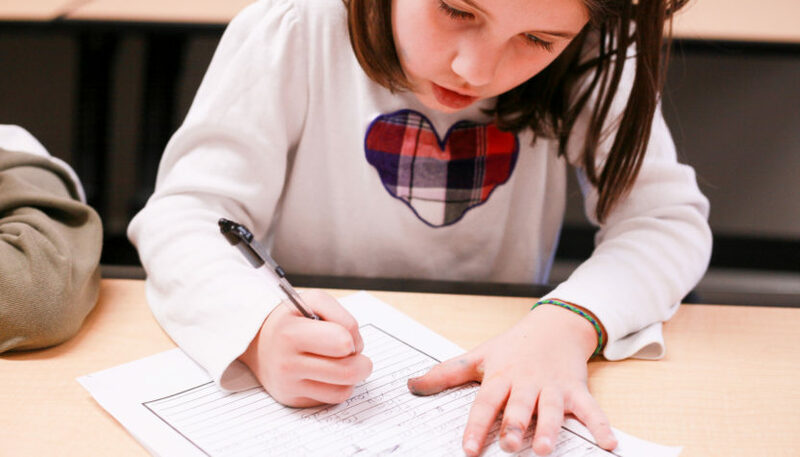 Each writing prompt plan was designed to help young writers think creatively, organize their ideas and finish their work in a short amount of time. My goal is to get kids to write often. There is definitely a time to focus on the complete writing process, drafting, writing, revising and editing. But that is not my goal here. For young children, I think spending too much time on one story, every time, can feel arduous for them. These ideas were created to keep writing active and fun. I want children to be able to complete a short story within a 30-60 minute time period. 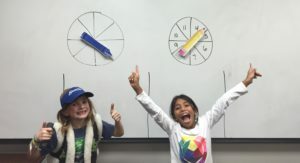 This way they can regularly feel the satisfaction of finishing and often celebrate their work, by adding an art accent, sharing their story and playing games. 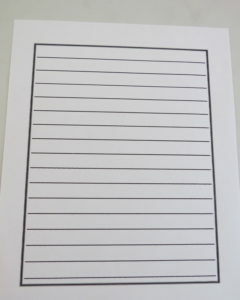 The PreK-K page doesn’t have any lines and is good for very early writers who may only write one or two words or sentences. Provide a fun platform for the students to, regularly and often, practice simple sentence structure, spelling and vocabulary. 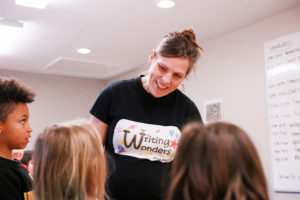 When I teach the year round writing workshops and camps, children ages 5-13 are in the same class. So, I write the plans with differentiation in mind. 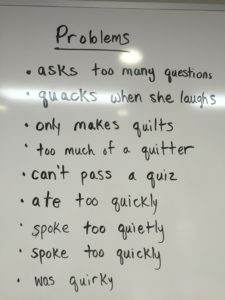 These lessons can easily be applied to a regular classroom setting, because in most cases, not all students are exactly on grade level with their writing. In a 3rd Grade classroom, some students might be writing at a 1st, 2nd, 3rd, 4th, or 5th Grade level. These lessons were designed with the heart for EVERY child to feel successful in writing their own story. 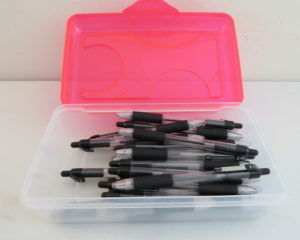 They are also ideal for homeschool families. A parent can conduct the same writing prompt with a 1st, 3rd and 5th grader at the same time. I begin each lesson by telling the genre and storyline. If there is specific vocabulary or a specific spelling pattern that we’re focusing on, I introduce it at this time as well. The students and I brainstorm ideas. 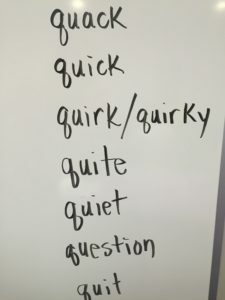 (The following pictures were taken when I taught the “Q-U” Queen Fairy Tale Writing Prompt) We were focusing on the spelling pattern ‘qu’ and brainstorming problems for our story. 3. Next, I show the 5 sections of the writing prompt. These 5 sections are crucial to helping children organize their stories. 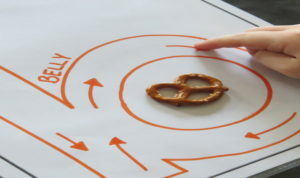 For example, a creative story will have an introduction, beginning, middle, end and conclusion. A persuasive piece will have an introduction, reason 1, reason 2, reason 3 and conclusion. Regardless of the genre (except for poetry), I always divide the writing prompt into 5 sections. Teaching children to anticipate and prepare to write 5 sections regularly sets them up for lifelong writing success (i.e. high school and college writing). A college thesis will typically have 5 sections. The only difference is that when we’re older, we’re simply able to elaborate using more words. (Introductions and conclusions may be shorter). This is a very important step. 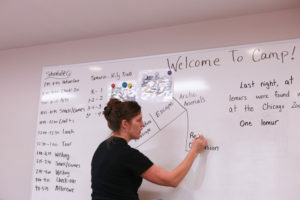 Showing the five sections and a general idea of how many sentences each age group should write helps the students anticipate their entire story and keep their ideas organized. 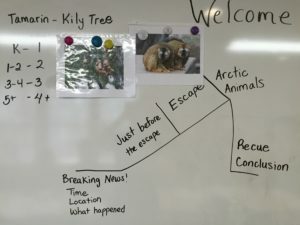 If I skip this step, students will tend to write too little or write way too much creating a run on story that doesn’t have a clear beginning, middle and end. When it comes time to write, I explain the general content of the first section, then give them time to write their own words. We move on to the 2nd section. I explain the general content that should come next, then they write their own ideas. We continue through each of the 5 sections that way. For the youngest writers or those with specific needs, I will ask them their ideas. I will then simplify their ideas into sentences that they can write and read. I write these sentences on the board for them to copy (while the older children are writing independently). Copying at a young age creates an opportunity for them to practice their letter strokes, spell common sight words and complete a story. It enables them to finish a piece that they can read. And you should see how proud and excited the small children are to show their story to their parents! For the independent writers, I offer my help continuously. The campers will often hear me say, “How’s everyone doing? Does anyone need anything? I’m here to help.” I tell them that if they want to know how to spell something to just ask. Then, I write it on the side of the board for them (and others) to see. In my classes, I want the students to enjoy getting their ideas on paper. I don’t want them to stumble or get stuck over spelling or writer’s block. I’m quick to help and serve as a resource anytime they ask for it. I know in my heart that by doing this often and regularly, they’re going to develop good grammar and spelling skills, build their vocabulary and gradually move into independent, confident writing. Introduce the genre, story line and any spelling pattern or vocabulary that you want to focus on. The children brainstorm their ideas. I write their responses on the board. Show the 5 sections on the board. Briefly, explain each section. Write out how many sentences each grade level should generally write. 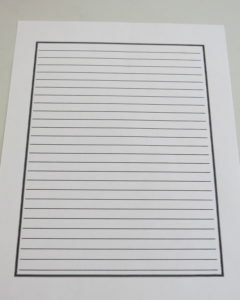 Hand out lined writing paper and pens. Explain section one. Give the children time to write. Set aside one section of the board to write a model story for the small children or struggling writers to copy (if they need it). Explain section two. Give the children time to write. Explain section three. Give the children time to write. Explain section four. Give the children time to write. Explain section five. Give the children time to write. Here’s the outline for you to print out and use. 12. Time for students to share their story while the rest finish. 13. Play 1-3 games depending on the time you have left. If you’d like to receive new writing prompt and game ideas regularly, you can sign up for my free monthly newsletter below!